COLUMBUS, OHIO — It was a shock to the senses. Iona, 38, UNC, 33. At halftime. Of the NCAA Tournament. With UNC as a No. 1 seed and Iona as a No. 16 seed. And, perhaps most crucially, with Roy “28-0 in the NCAA First Round” Williams coaching. These things didn’t happen, the Tar Heels bricking layups, not being able to get on the break, and No. 1 seeds trailing at halftime. Even UVA, unfortunate victims to UMBC last year, still entered the locker room tied before losing by 20. So, what do you say to a locker room after such an anomaly? Do you make drastic changes, changing defensive schemes to ward off another 10-for-21 performance from three like the Gaels had in the first half? Do you scream in the players’ face, making the obvious situation crystal clear to the team? One could panic like that. Most of us would. Or, you could do what Roy Williams did. Remind the team who there were, and how they could play, and, in the nicest way possible, tell them they weren’t showing the passion needed to get through. Took care of itself, indeed. With the added emphasis on doing the little things right, and playing with heart, the Tar Heels (28-6) outscored the Gaels 55-35 in the second half, holding Iona (17-16) to just 8-of-25 from the field and 5-for-20 from beyond the arc while shooting 62.9 percent (22-35) themselves in the final 20 minutes. Schematically, Roy Williams said, he made very few adjustments at halftime, only telling his 1 through 4 players to switch on ball screens rather than create a hard edge like they had done in the first half. But, he noted, Iona didn’t screen that much, so not much changed on the defensive end besides his team playing harder and doing a better job of getting in people’s grills. It helped, of course, that UNC was the more talented team. “Bigger, stronger, more blessed” to use some of Williams’ favorite phrases. And that Iona came down from the nirvana of their shooting in the first half to finish with a percentage from three (36.6 percent) closer to their season average (33.9 percent). But, as Cameron Johnson points out, there’s a reason that percentage dropped so fast. Offensively, an increased emphasis on UNC’s size advantage in the post caused Iona problems down the stretch. Inside-out passes for threes, Maye and Garrison Brooks making the bunnies they missed in the first half, and Nassir Little dropping 19 off the bench thanks to aggressive drives with vicious finishes. Little’s 19 were the most points for a freshman at Carolina in the NCAA tournament since Harrison Barnes dropped 20 in the Sweet 16 of the 2011 tournament against Marquette. It was an effort to be proud of, at the end of night, though certainly one with room for improvement. UNC moves on to face Washington and their 2-3 zone on Sunday at 2:45 p.m. For Roy Williams, he just hopes the Iona win will serve as a lesson in a broader story. “I told them in the locker room, every tournament's different,” Roy Williams said. “I was on the staff of a pretty good team -- 1982. And the first game we played James Madison in Charlotte. And we blew them out, 52 to 50. 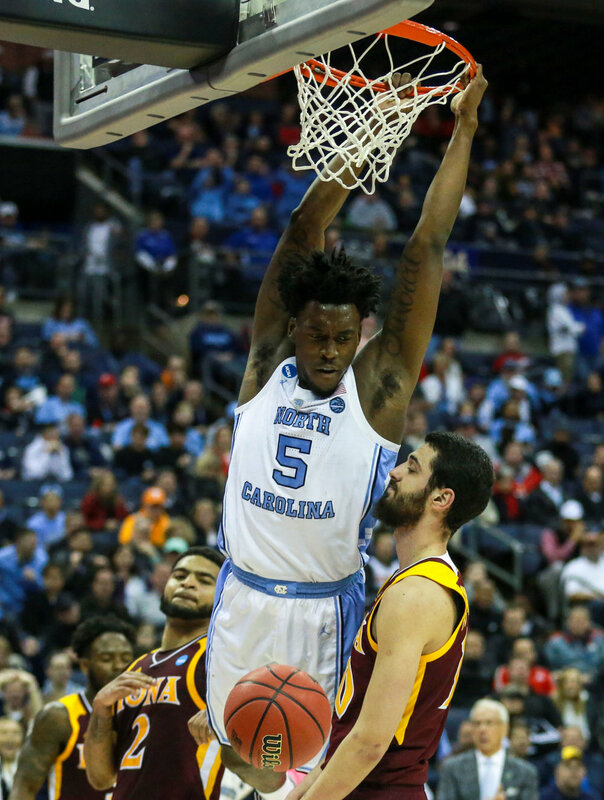 "More gifted, more blessed, more talented"
UNC dominates the hapless Golden Eagles in a performance that pleased Roy Williams after a blown second half Monday night. "Not in the same freaking universe." The Tar Heels are easily a Top-25 team after a 10-3 record in non-conference play. But while there’s plenty of positives, the holes on the 2018-19 Tar Heels are glaring at the start of ACC play. UNC’s pair of 4-year seniors end their careers at PNC Arena 4-0. But they wouldn’t have gotten that final win without the senior that’s 2-1 in Raleigh.